Does East Falls deserve a special exception to the ZBA’s special exceptions for group homes in residential areas? UPDATE 6/18: KenCrest’s plans for a transitional care home move forward despite Community Council opposition. Kencrest’s attorney confirms that KenCrest received their approval per the FHA. UPDATE 2/20/18: After near neighbors demanded Community Council’s zoning committee to reconsider their previous “No opinion” vote, EFCC drafted a new letter, this time stating a firm “NO” to Kencrest’s proposal and refusing any further negotiations. CORRECTION (2/2/18): The original version of this story incorrectly stated that EFCC’s Zoning Committee voted to oppose KenCrest’s application in their January meeting. The Committee voted “No Opinion” at that meeting, according to EFCC President Bill Epstein. The article has been revised. Gah! Can we take a step back, first? Make sure we know what the rules are before threatening legal action. Philadelphia’s zoning code – while spectacularly complicated – strives to be fair and logical. Our situation is not unique, there are guidelines for just this sort of thing. DISCLAIMER: I am not a lawyer! I am doing my best to share my understanding of zoning rules and translate what (I think) KenCrest’s lawyer, Bill Kerr, explained to about a dozen neighbors at EFF’s January meeting last week (key points transcribed at end of post). 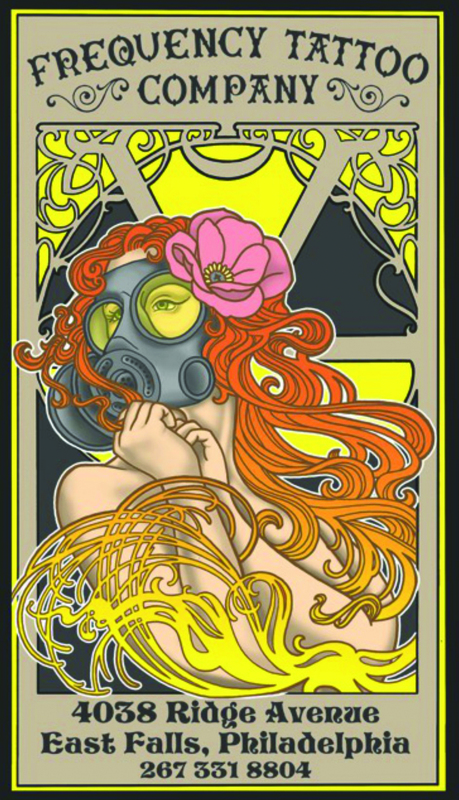 Please follow the links provided to the sites I used for reference. Corrections & different interpretations welcome! So. Every area in the city is zoned by block one way or the other, and this location at the corner of McMichael park is zoned “RSA1” which means a residential area with detatched/attached single family homes on individual lots. 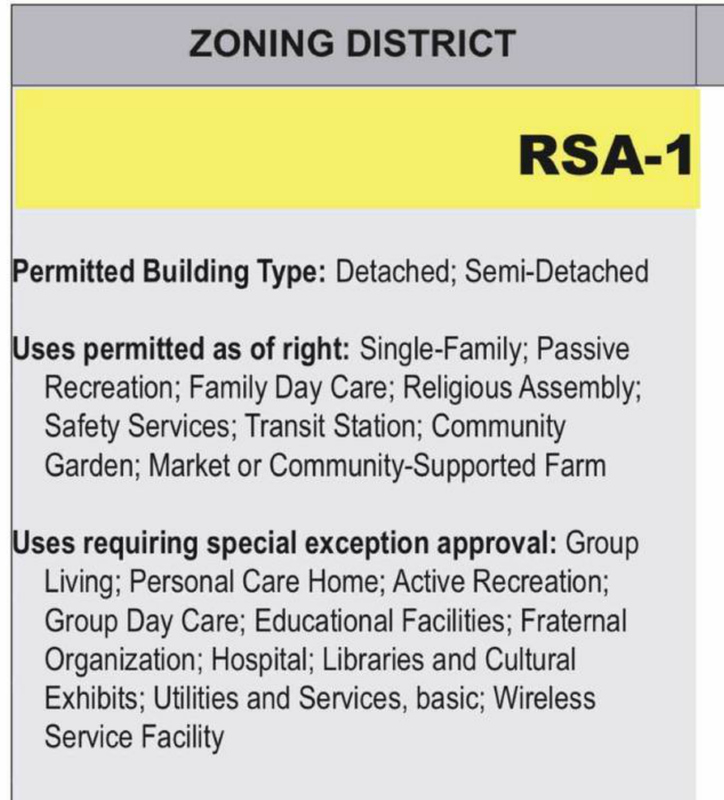 However, this zoning also recognizes a mix of uses including parks, bus stops, religious spaces, and family daycare. These mentioned are all allowed “by-right,” which I like to think of as the “green light” of zoning: go ahead, property owners, you’re in the clear! At the other end of the spectrum, retail businesses, night clubs, apartment buildings, etc. would be a “red light” in this residential area: whoa, Nelly! These uses are not allowed without special zoning, aka a variance. Property owners must present to the community and at a public ZBA hearing where the Board weighs neighbors’ wishes with the applicant’s to decide if they should re-zone or not. Somewhere in the middle, Philadelphia zoning allows “special exceptions” for certain uses that are not quite permitted by-right but are allowed on a conditional basis. For RSA1, this includes personal care homes, educational facilities, libraries/museums, hospitals, and group living. In these instances, property owners need only to prove to the ZBA that they fall into one of these “pre-approved” categories. 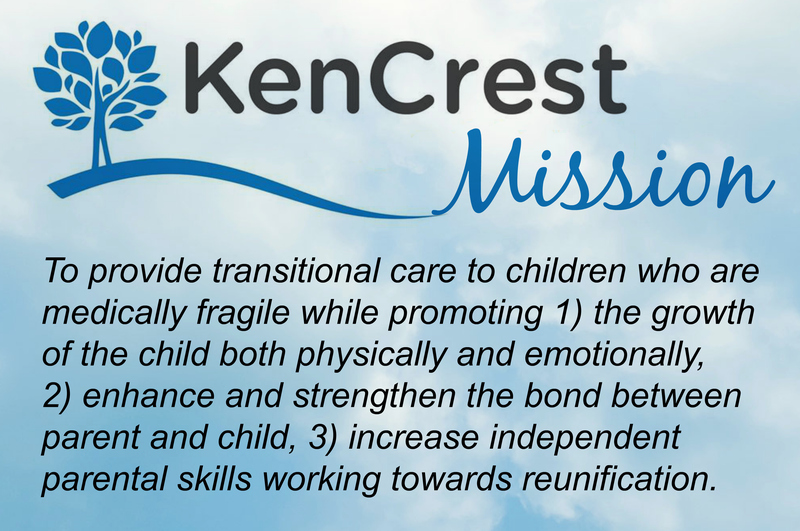 Last August, KenCrest applied to L&I to change their special exception from adult daycare (as they’ve been operating for 10+ years) to a transitional home care for children. 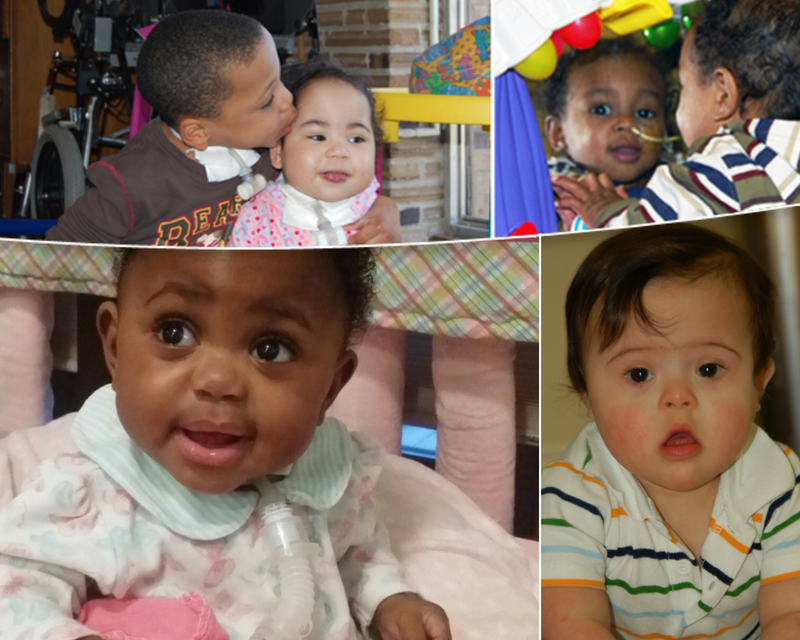 But Philadelphia doesn’t have a “group home” special exception for medically fragile children — just adults. And when the L&I clerk checked off “hospital” instead of “group home” on KenCrest’s application, that kinda freaked out some near neighbors, who worried there’d be ambulances screaming down the street. When Bill presents at ZBA for KenCrest, he will argue that they’re not proposing a hospital, but a group home. He feels the Zoning Board will agree that changing their special exception from “adult daycare” to “group home” is a reasonable request that will not create any additional nuisances for the community. KenCrest believes a home for six kids will in fact cause less impact in this location than the adult daycare that operated here (which had daily drop-offs/pickups). Near neighbors opposed to KenCrest’s transitional care home will need to provide proof that granting a special exception will cause detriment to public welfare. Objections can’t be vague or theoretical – the ZBA wants iron-clad evidence, not just opinions and speculation. As you can imagine, this ain’t easy – and that’s kind of the point. 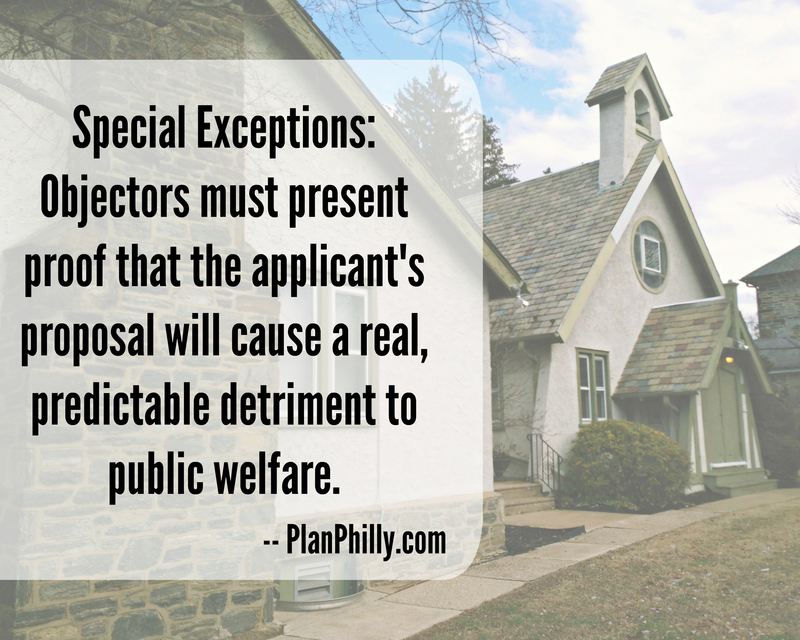 Special exceptions aren’t variances — they’re allowances for uses that the city has agreed are compatible with a similar zoning. Though many neighbors seem intent on opposing KenCrest’s special exception, the ZBA meeting is not about neighborhood preferences. The Board just needs to verify that KenCrest is providing a service that meets their criteria. 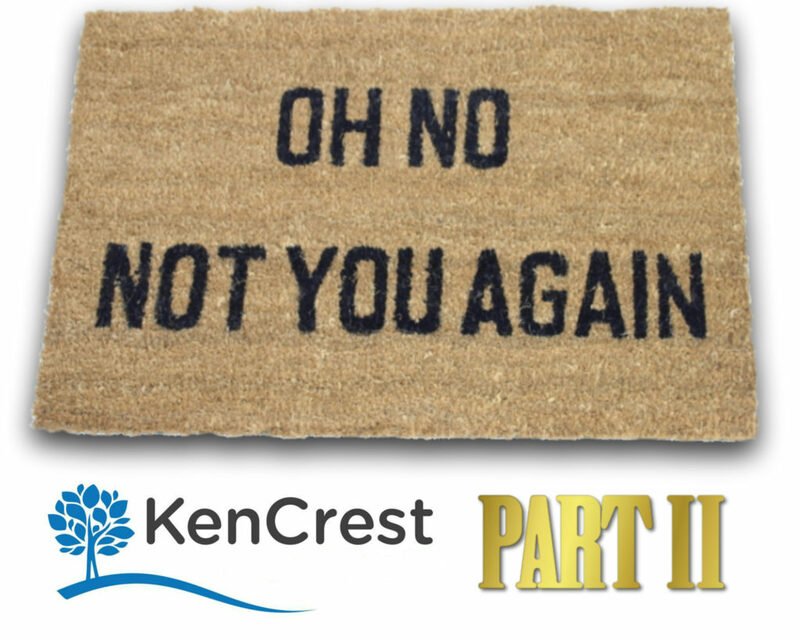 But for KenCrest, their only option is a continued residential care model. They’ll literally lose their funding if they fail to demonstrate they’re serving individuals as part of a community – that’s their mission, to provide a home for the disabled, the challenged, the medically fragile. Not a hospital. It’s unclear what the near neighbors hope to achieve by pushing for a “hospital” special designation vs a “group home” one (both are allowed in RSA1), but we’ll see soon enough: the public meeting is scheduled for Wednesday February 21st. NOTE: KenCrest wants to request a special separate ZBA meeting, apart from the usual City Hall parade of one case after the other. Still public, but held in its own room so we’ll have time to work everything out without holding up everyone else. Standby for a new date as soon as we have one, meanwhile if you’re interested in going please email us to get in the carpool loop. SPEAK UP! Thanks to everyone who came out to EFF’s January meeting with thoughtful questions & comments for KenCrest. 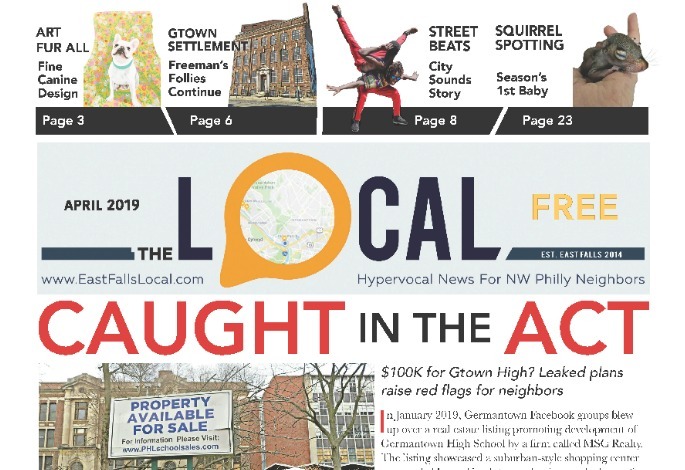 Join East Falls Forward, it’s free and you get to chime in on all kinds of neighborhood stuff! LEARN MORE about KenCrest’s plans in East Falls, including site plans and full transcriptions of Bill’s presentation plus audience Q&A (from November’s EFCC meeting). You’ll also find info on the transitional care home KenCrest has been quietly operating in Roxborough since the 1980’s. BELOW: Transcription of clips from January’s EFF meeting, that address some of the points I was trying to cover in this post. So, KenCrest’s mission to put the children in a residential neighborhood, where group homes for adults are allowed – seems a logical place to propose a group home for children. We filed the application with L&I. In an effort to be transparent, I specified it would offer nursing care. The L&I examiner — who quite frankly I have not worked with before so I think they’re relatively new – categorized it as a hospital. So when they issued their refusal, they didn’t issue it as a special exemption for a group home but they issued it for a hospital. And folks at East Falls Community Council had seen that and sort of latched onto that. And so they’re upset because they think this is a hospital. It’s not a hospital. It’s a group home for kids who require some medical, some nursing care. Roberta Ginsberg (Midvale): But KenCrest has been here for over 30 years already. Rich Gardner: And yeah that’s the thing. Granted it’s actually a less obtrusive usage of the property, right? Than the daycare. What they’re proposing. But. The fact of the matter is, when KenCrest decides to pull up stakes and goes elsewhere, what’s left? Steve Fillmore (Gypsy Lane): I think that’s what he was saying, they’d have to come back for a variance. Brian Kistler (Midvale): I think there’s some concern whether or not that protocol will exist forever, or whether possibly five years from now Philadelphia zoning will change and say OK this use was already in place and we’re just gonna grandfather that use to anyone else that decides to take over that property, no one can predict that. So the near neighbors are taking the stand that we’re not even going to let it get to that point. We’re just gonna shoot it down now. You’re gonna go there and make the argument that it’s not a hospital. We’re gonna make the reverse argument that, no, it is a hospital. We’ll read why we think it’s a hospital, you’ll explain why you don’t think it’s a hospital, and the ZBA will rule one way or the other. And then if you’re gonna take it to another level of court, then we’ll follow you there and we’ll go thru this for the next five years, arguing back and forth. Not exactly sure how that benefits everybody but that’s the path we’re going down. Brian Kistler: May not to you but it was a bother to some of the near neighbors. KenCrest COO: The trash what was happening when we had the daycare in there, they’re only there Monday thru Friday from 8am to 4:30pm. So initially the staff put the trash out at 4:30 on a Friday and that’s not cool. For the last 10 years we’ve paid someone to come and put the trash out on Sunday night. It was an issue. The parking, I agree with you, there was a time when it was a heavy administration building, and some of our staff behaved poorly. And some of those people weren’t even our staff, you know, someone comes for a meeting or to see someone. And we put certain things into effect to really try to eliminate that. It wasn’t acceptable to us. We don’t want to be bad neighbors. We really try to work hard. As COO, I’d be willing to talk about having an ambassador. Someone we could meet with frequently to see how we’re doing: what are the complaints, did we do anything wrong? We will not be funded if we can’t demonstrate the individuals we provide support and services to are part of the community. Are in a community. That’s why we don’t have US Food Trucks driving down the street, dropping off our food. Or we don’t have institutionalized type settings. They are in a community and we reflect that, they are in a community home. Shop Kencrest! Home & garden items handcrafted by artisans with Intellectual Disabilities (proceeds help support the organization). All statements from KenCrest sound founded in good sense and follow established rules. Statements by those opposed seem based on biased emotion without facts. Just what has happened there in the past that scares them so? What change from adult care to child care scares them? And, the comments about changes in far future raised …really, how does anyone even know if one will even live here in 10 or 20 years? It seems to me that any zoning changes in future would need same restrictions as this KenCrest proposal now. 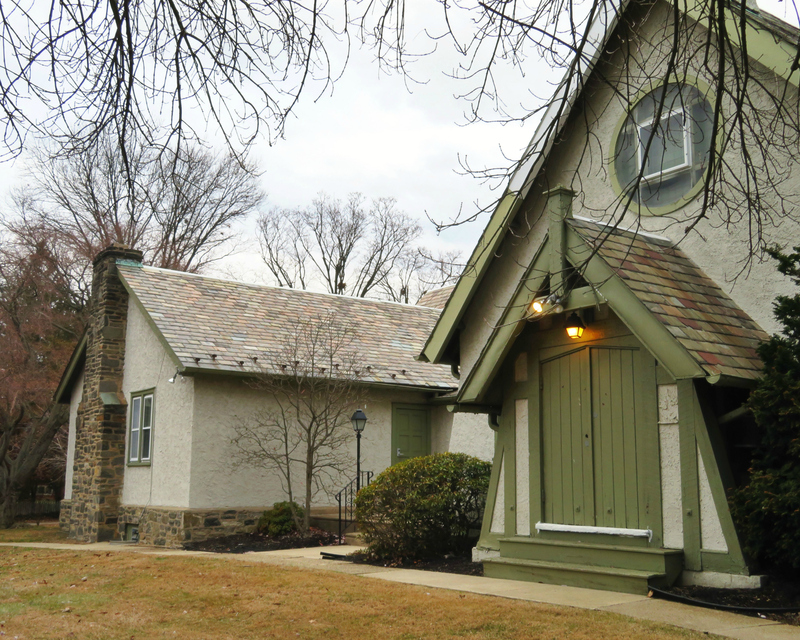 This is not a ‘hospital’ proposal but a home where young children reside for months to regain health, no different than if neighbors with children moved into any home in East Falls. Many homes here have accommodations for several children and adults. Six bedrooms seem common. No ambulances, medical supply trucks, nor abundant vehicle parking is indicated. Parking in this area is congested far more by medical school and college students currently than by any residents. There seem residents in East Falls, maybe only around McMichael Park, who seem very frightened by any changes at all. Some complained about speed bumps if a playground were to be built in the park! Change happens. This proposal from KenCrest seems well considered and follows longstanding rules with provisions to cause minimal, mostly improved or unnoticed, change to this lovely area. I ask those opposed…what would you rather have move to this site to occupy this unique building? Have you considered what could come if KenCrest vacated the property? A caring home for kids and families surmounting odds most of us never have to deal with seems to me a wonderful and valuable addition to this neighborhood. We should feel honored to be chosen for this honorable endeavor.